Udaipur : In line with the commitment to encourage young talent through a comprehensive mix of experience and education-based initiative, Nestlé India conducted its unique skill enhancing programme, N- Reach, for students atCollege of Dairy & Food Science Technology (CDFST), Maharana Pratap University of Agriculture & Technology (MPUAR), Udaipur. The programme,N-REACH was a four-day workshop which is divided into two parts and focused on Leadership Development, Emotional Intelligence, Accountability and People Management. The participating students were also given a case study at the end of the workshop and received certificates on completion of the training. Speaking at the closing ceremony,Mr. Suresh Narayanan, Chairman and Managing Director, Nestlé India said, “I always feel energized looking at youngsters and I am extremely grateful for the support we have received from Prof. Uma Shankar Sharma and the entire faculty at the University. My experience today has been positive and enriching. The talent that the students at CDFST have to offer is very impressive and I wish them all the best for their future endeavours”. 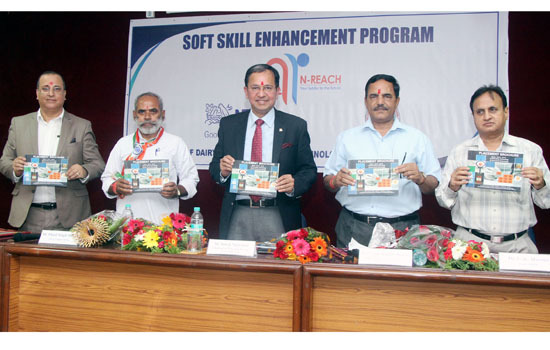 Prof. Uma Shankar Sharma, Hon’ble Vice Chancellor, MPUAR, Udaipurcommented, “Soft skills have always been an integral key to success and we are glad that N-REACH programme recognizes the importance of the same. We hope that our students get more of such opportunities in the near future”. N-REACH is aimed at enabling the final year students pursuing food technology to be more prepared in terms of the challenges which they will face daily on entering the professional world. It is specifically focussed on soft skill enhancement of the students to bring them a step closer to success. NestléIndia has also conducted this programme with National Dairy Research Institute at Karnalrecently. The programme is conduced by experienced trainers which incorporates sessions facilitated by a mix of alumni of the institute and a team of external trainers.